I wanted to make an easy and secure way to enter my garage. RFID was the best way to unlock my door, even with my hands full I can unlock the door and push it open! I built a simple circuit with a basic ATMega 168 arduino chip and a ID-20 RFID reader to control an electronic door lock. The circuit consists of 3 separate parts, a Reader to read RFID tags, a Controller to accept data from the reader and control the output of the RGB LED and the Electric door lock. The door lock is first installed in a door and tested with a 9v battery to ensure correct installation. In most cases you want a Normally Open circuit on the door lock, or Fail Secure. This means the door stays locked when no current passes through it. When 12vDC is passed through the electromagnet in the door lock, a plate in the lock gives way and allows the door to be pushed open freely. The reader is placed on the outside of the door and is separate from the controller on the inside so that no one can circumvent the security by breaking open the Reader and trying to short circuit the reader. The controller receives serial data from the Reader and controls the RGB led and the Door lock. In this case I have put both on separate bread boards for testing. Here is a video overview of the system in action. Here are a list of parts and links to SparkFun.com where I bought them. This is the basic set of parts you need to build and arduino and a circuit to read RFID tags into the arduino. I am assuming you have a breadboard, power supply and hookup wires already. Door Lock is from ebay. 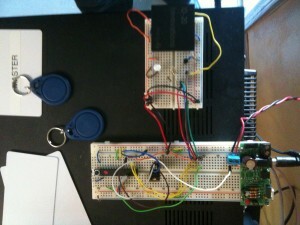 The first step to building a RFID door lock with a basic Arduino is to bread board out a basic working arduino. Most Arduino pre-flashed ATMega 168 chips come with the default blink program pre installed. Connect a LED to digital output 13 and verify that everything is working. 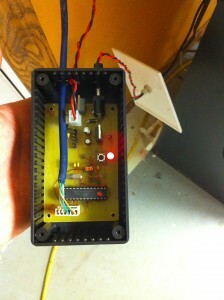 The hardware portion of this RFID reader would be too simple if we used a regular arduino with built in USB programmer. Since I plan on putting this into the wall and not touching it again I dont want to use a big bulky $30 arduino board when I can buy a $5 ATMega 168 and make a much smaller custom PCB. Because I chose to make a basic Arduino circuit myself I need an external USB->Serial FDIT programmer. I have included Eagle schematics of the controller with a power supply built from a 7805 voltage regulator. In testing I used a bread board power supply. To get an arduino up and running all you really need is the ATMega168 with the arduino software flashed on it, 2x 22pF capacitors, 16mhz crystal, 10k ohm resistor, push button and a breadboard. The hookup for this is well known but I have included the entire schematic for the circuit. The arduino is going to trigger 4 outputs, 1 each for Red/Green/Blue LEDs, and 1 to trigger the TIP31A to send 12vDC to the door lock. The arduino receives serial data in on its Rx line from the ID-20 RFID reader. Now that you have your arduino bread boarded and working you can put together the RFID reader portion of the circuit that will contain the ID-10 or ID-20 and RGB LED to indicate the status of the circuit. Remember that the reader will be outside and separate from the controller inside so that someone cannot easily break in. To build this, we are going to send 5v/Ground over from the primary bread board to a secondary bread board we are building the Reader on. Also send over 3 wires from 3 of the arduino output pins to control the RGB LED, one for each color. One more wire, Brown in the pictures, will be a serial connection for the ID-20 to talk to the arduino’s Rx serial input. This is a very simple circuit to connect. LED’s get resistors and a few points on the ID-20 are tied to ground/5v to set the correct status. To make it easier to breadboard the ID-10/ID-20 Sparkfun sells a Breakout board that allows you to attach longer pin headers that are spaced to fit a bread board. This part and the pinheaders and listed in the parts list. The schematic should be strait forward and easy to follow. Time to program your arduino. This can be a bit tricky using a basic arduino, you may have to press the reset button multiple times before and during the first part of the upload. A very important thing to remember, you WILL get an upload error if you do no temporarily disconnect the ID-20 serial line to the arduino’s Rx line. The ATMega168 only has 1 Rx input and it uses it to upload code to talk to the programmer. Disconnect the ID-20 while programming then plug it back in when your done. I used a FTDI programmer which allows you to program the arduino via USB with only 4 wires. The Controller schematic shows a pin header connection to allow you to plug one in directly. Sparkfun also sells this part but many may already have it. You can easily upload my code to your arduino and never look back but whats the fun in that? Let me explain the basic idea of how it works. First of all, I did not want any external buttons/switches/etc and I did not want to reprogram the arduino every time I wanted to add a new card. Therefore I wanted to use only RFID to control the operation of the circuit as well as control over the door lock. The program turns on the Blue LED to indicate it is ready to read a new card. When the card is read it decides if it is a valid card or not by comparing what it read in to a list of valid cards. If the user is valid, the arduino turns OFF the Blue LED and turns on the Green LED for 5 seconds. It also turns on another output high for 5 seconds. This output is connected to the TIP31A transistor and allows the tiny arduino to control a much larger 12v 300mA door lock without being damaged. After 5 seconds the door lock re-locks and the LED turns back to blue to wait for another card to be read. If the card is invalid then the LED changes to RED for a few seconds and back to Blue to wait for another card. It is important that the door lock still work even if the arduino loses power overnight or is reset. Therefore all valid card ID’s are stored in EEPROM memory. The ATMega168 has 512 Bytes of EEPROM memory. Each RFID card has a 5 Hex Byte serial number and a 1 Hex Byte Check sum that we can use to verify there were no errors in the transmission between the ID-20 and the arduino. Valid cards are stored in the EEPROM by using the first Byte as a counter. For example, if there are 3 valid cards stored the first Byte in the EEPROM would be 3. EEPROM.read(0); = 3. Knowing this, and the fact that each ID is 5 Bytes long we know that 1-5 is card one, 6-10 is card 2 and 11-15 is card 3. We can make a loop that looks through the EEPROM 5 bytes at a time and tries to find the card that was read in by the reader. But how can we add new cards to the EEPROM after the circuit is installed?? I have read in one of the RFID cards I have and hard coded it to be the Master RFID card. So even if the entire EEPROM is wiped the master card will still function. Whenever a card is read, it checks first to see if it is the Master card, if not, then it continues to see if it is a valid card or not. If the card is the master card we have the arduino go into a “programming mode” where it flashes RGB and waits for another valid tag to be read. The next tag that is read is added to the next free spot in the EEPROM and the counter is incremented 1 if the card does not already exist in the EEPROM memory. The reader then returns to normal mode and waits for a new card to be read. Currently I have not programmed a way to delete a card as the reasons for deleting a card would most likely be it was lost or stolen. As this would most likely be used with 1-10 people the easiest thing to do would be to hard program a Master Erase card that will wipe all cards from the EEPROM then re add them all, which only takes a few seconds. I have added code to wipe the EEPROM but I have not implemented this feature yet. . The code is attached in a text file along with a copy of the parts list. This is only some of the cool stuff you can do with RFID. You could expand this much further with a LCD output, logging of who enters and when, network/twitter connection etc. I plan on making a finished PCB version of this circuit. 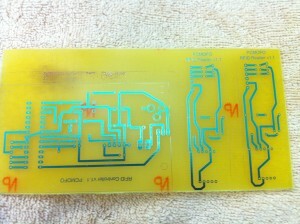 I have never made a PCB before so I am still working on the design and layout of the parts. Once I have them complete I will post them as well. I encourage anyone to take the code I have written and modify it to do even more cool things!